Fatman Wi-Tube and FatDock go wire-free | What Hi-Fi? 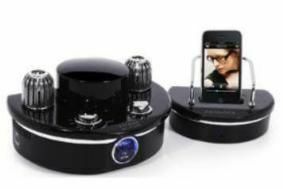 Working as a pair, the FatDock will house, charge and receive content from your iPod/ iPhone, then wirelessly transmit it to the Wi-Tube valve receiver which delivers 28W per channel. Decked out in classic piano black and chrome, with a few subtle Cadillac curves, the wireless duo talk design as well as wireless tunes, while a blue-lit retro VU meter glows from beneath the Wi-Tube's incandescent valves. In fact, the FatDock can take its music from any source equipped to deliver sound via a 3.5mm headphone jack, and sync with Macs and PCs via USB. It's due to go on sale in April for £399. The FatDock/Wi-Tube will be launched at the Bristol Sound & Vision Show, running from February 26th-28th.